Note: This post contains affiliate links. Your purchases help Luke learn how a microbusiness works. Thanks for giving him homework! There's some exciting goings-on at Lilla Rose Strawberry Princess!! First up, is a special summer sale! but there is a new July Flexi of the Month ALSO on sale. Awesome, yes? But how about if I tell you that if you shop now, you're not just getting yourself some pretty accessories, but you're also helping a little girl get a Service Dog? Freida has a number of medical conditions. Among them are Tourette's Syndrome, OCD, and ADHD. However, her biggest issue right now is called Ideopathic Anaphylaxis. IA is a life threatening condition where Freida's immune system sees the whole universe as a giant allergen, and she experiences symptoms from hives to breathing issues with almost no warning. She's an awesome kid, though. She doesn't let any of these things stop her. Last fall, she collected Chanukah cards to send to American soldiers stationed overseas. At Passover, she collected macaroons for more soldiers. All of this with a smile on her face. Having a service dog would be such a blessing for Freida. Bravo will be able to help her family help Freida when she is struggling, and bring comfort to Freida when times are tough. Unfortunately, training a service dog takes a lot of kibble! 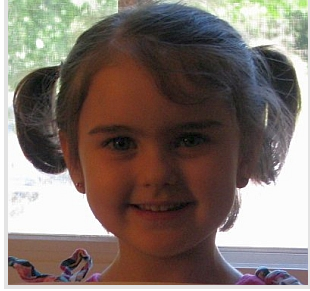 That's why I'm honored to help by sponsoring a Lilla Rose party in Freida's honor. 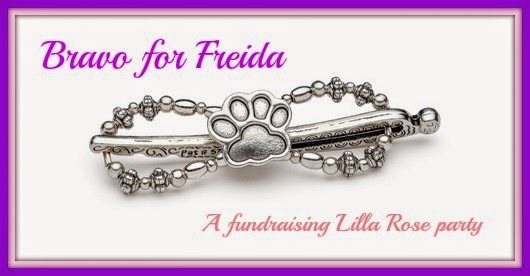 By clicking on the Paw Print Flexi, using this link - Bravo for Freida Party - you can help Freida bring Bravo home. Up to 40% of the retail value of your purchase will be donated to Angel Service Dogs/Bravo for Freida. If you want to keep up with how Freida is doing, you can join the Facebook Page Mitzvah for Freida Rochel. Thanks for your purchase -- and thanks for helping Freida! Angel Service Dogs™ Inc. is a 501-C-3. In the event Bravo does not pass certification, another dog will be trained with the same specifications and this fund will be transferred to that dog. Additional funds raised from this campaign will be transferred into the Angel Service Dogs, Inc. General fund to help train dogs for other families.